Home to the world’s largest bears, largest salmon and largest population of bald eagles, the state doesn’t do wildlife and wilderness by halves. When exploring Alaska you will be at the heart of this wild beauty, discovering one of the world’s last frontiers for yourself. Cruising aboard a luxury ship, passengers witness the dazzling fjords which give way to the lush coniferous forests of the coast. Beyond lies a diverse tapestry of landscapes from arctic tundra to meadows decorated with wild flowers. Ancient trees are dwarfed only by the mountains of the Alaska Range with the plateaus of the interior stretching out to endless horizons. Roaming across the landscape and soaring above it are an incredibly diverse array of wildlife. 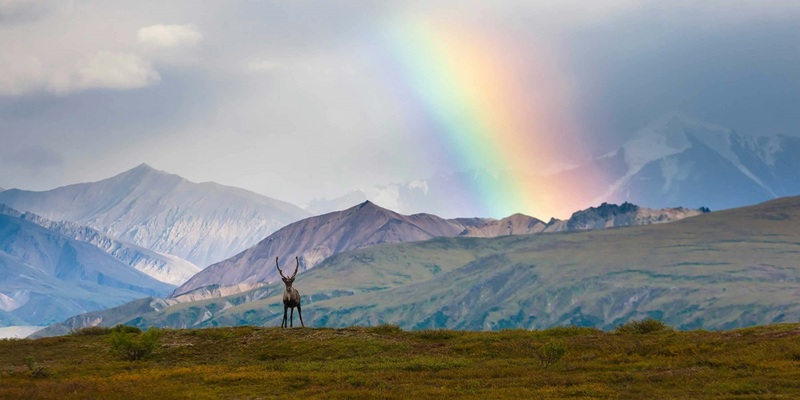 Herds of caribou wander in the shadows of the great mountains and can be viewed from special vantage points in Denali National Park. Golden eagles wheel in the clear blue sky, and there are wolves and moose to sight along with three species of bear. At the heart of the Alaska Range, reflecting in pristine Wonder Lake, is north America’s highest mountain, Mount McKinley. At a staggering twenty thousand feet it is one of the most formidable mountains in the world and its crest shimmers with snow and ice. The state’s population live harmoniously within the natural world, and on Alaska holidays you will also get the chance to learn about the unique native culture that continues to thrive there. In the state capital, Juneau, there are a number of fascinating museums where visitors can learn about the human history of the region and the gold seekers who flocked there to make their fortune. Wildlife spotting opportunities aren’t confined to the land. Alaska boasts a network of ancient fjords which are visited by some of the world’s best loved sea mammals. Prince William Sound is the stepping stone for oceanic exploration, where the water is home to harbour seals, orca whales and otters. Ships cruise along the inside passage past the sublime scenery where whale watching tours and wildlife walks can be enjoyed. There is also the chance to walk on the glaciers in Glacier Bay and learn about the fascinating geology of the region from an expert. Alaska’s wild beauty has a sheer scale and brilliance that can only truly be experienced firsthand. Join the adventure and discover one of the world’s last true frontiers for yourself.